I'm in the midst of writing my second book, and I keep getting caught up in one thing or another, and before I know it my will to write is at its wit's end. That's when I pick up a book and just read. I read a wide variety of books, though I read more YA and Fantasy, and I can't help but think, "What keeps me reading this awesome book?" Why I've been gone & Fancy yourself! It's so good to write a blog post after I've been neglectful for sometime. Unfortunately, I don't know when I'll be able to post again with my schedule, but I'll be making an effort to check up when I can. 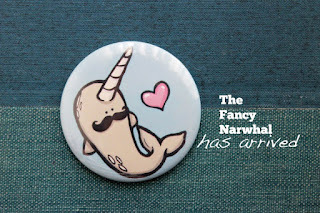 On a good note, the reason I've been gone: I finally opened my new store, The Fancy Narwhal. Take a peek at it, and if something catches your fancy (hurr), pick something up! It's been challenging trying to juggle so many projects, but I'm really excited, tired, and ready for more adventures!